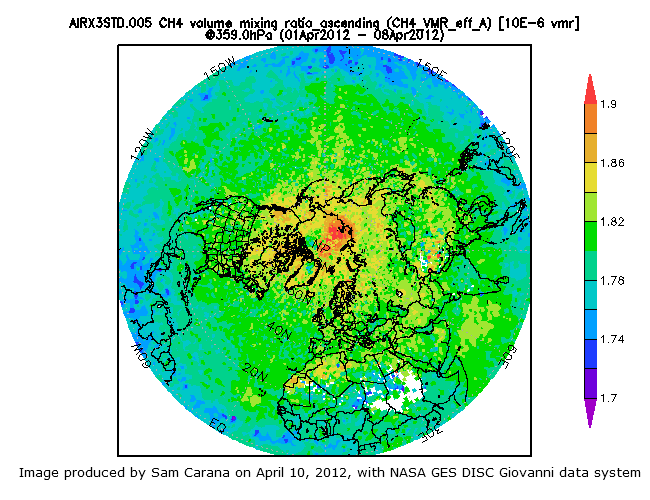 Below are two images produced with NASA GES DISC Giovanni data system, showing methane levels for early April 2012. 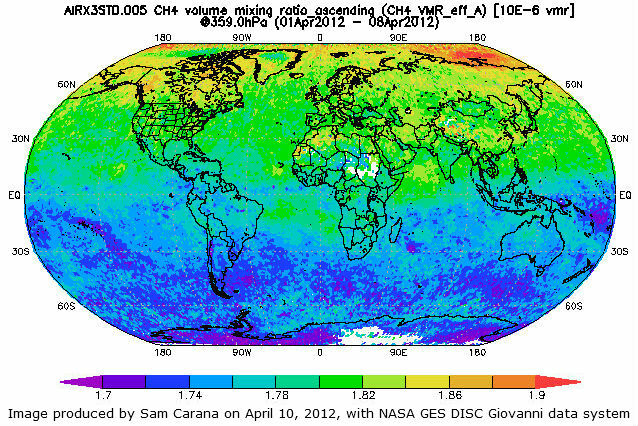 The top image shows where methane levels exceed 1.9 parts per million. The image below is a polar projection; note the different scale on the right, which is the default one that is automatically calculated and exceeds 2 parts per million. Below the same image as the above one, this time with the same custom scale as the top image. This animation is a 774 kb file and may take some time to fully load. 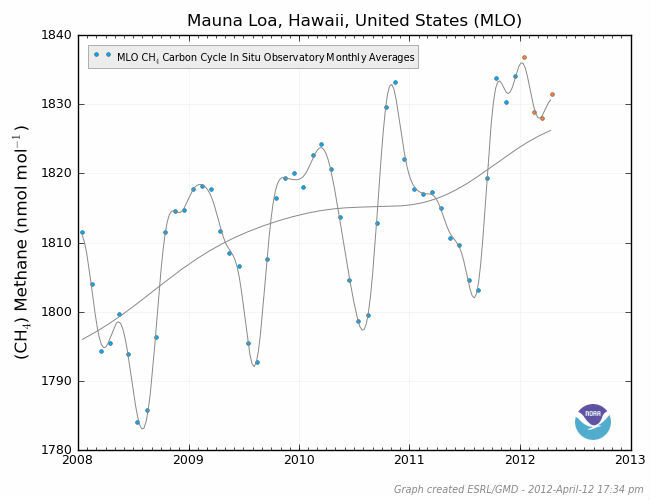 Methane levels at Mauna Loa, Hawaii (directly below) and Barrow, Alaska (further down below). Very interesting. Thanks. 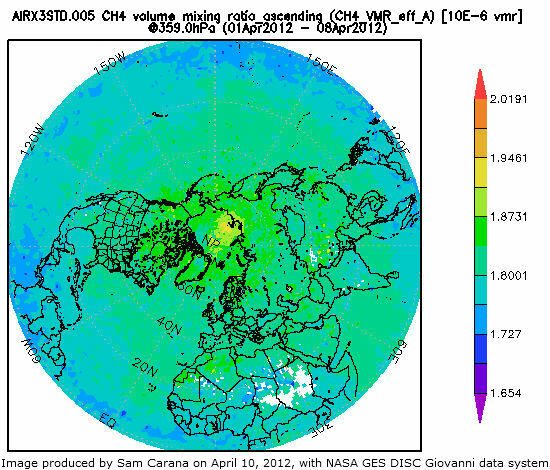 As you know, methane plumes a kilometer wide were recently reported in the East Siberian Sea. It seems the clathrates have become destabilized. There goes the Holocene. 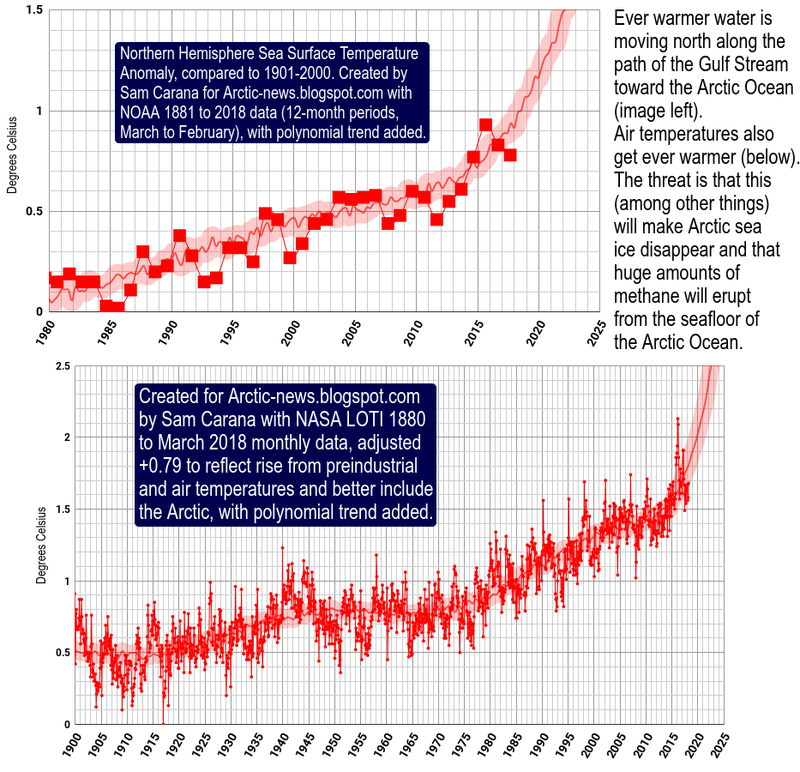 Tenny over at Climate Change: The Next Generation posts that the first year ice is already starting to break up, and mentions Dr. Wadhams. Any news on this? Thank you for the links! 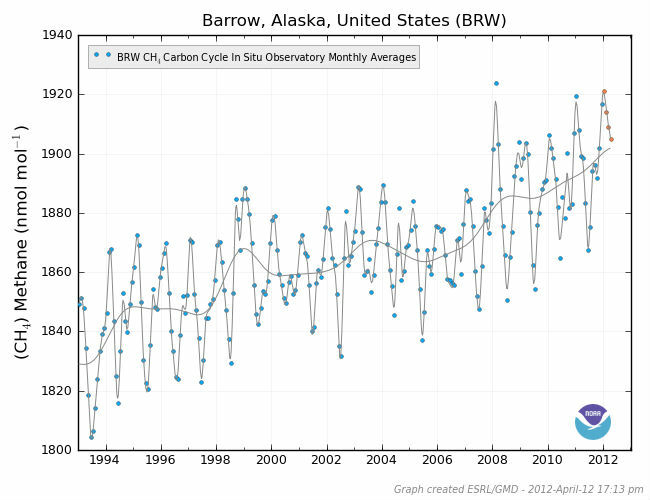 Dr. Wadhams paper on the effects of an arctic oil spill was very interesting, and I did see the 2015 estimate there. But what I meant (and did not make very clear) was that it's being said that this year's ice is breaking up 2 mos. early, perhaps due to high surface temps, water temps or wind? Any news on this? I'm not sure what post by Tenney you're referring to, could you perhaps give a link? 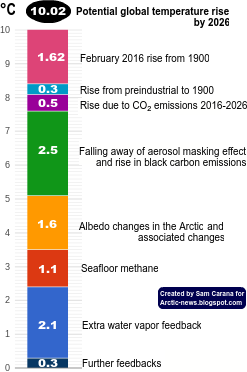 Are you perhaps referring to the BBC post Climate 'tech fixes' urged for Arctic methane by Richard Black? This one, dated Wed, April 11, 2011 Arctic Sea ice undergoing spring breakup two months early -- you have to scroll down to see the post. Sorry to harp on it, just curious to see if you've heard/seen anything. I'm not sure what Tenney or Peter are referring to, but as the PIOMAS Daily Arctic Ice Volume image shows at Arctic Sea Ice, the March 2012 ice volume was 20,800 square kilometers. If you look for a similar volume on the mean volume graph for 1979-2011, you'll end up somewhere in June. If you look at it that way, saying that spring levels are two months ahead is a rather conservative statement. Anyway, be assured that I'll keep watching things.